On a trip to Bangkok a few months back, we stayed at a hotel on Sukhumvit 23. (We left on the Saturday the red shirts were setting up camp at Ratchaprasong.) So going anywhere, the most convenient route to and from the BTS or train station was through Soi Cowboy. Honestly. 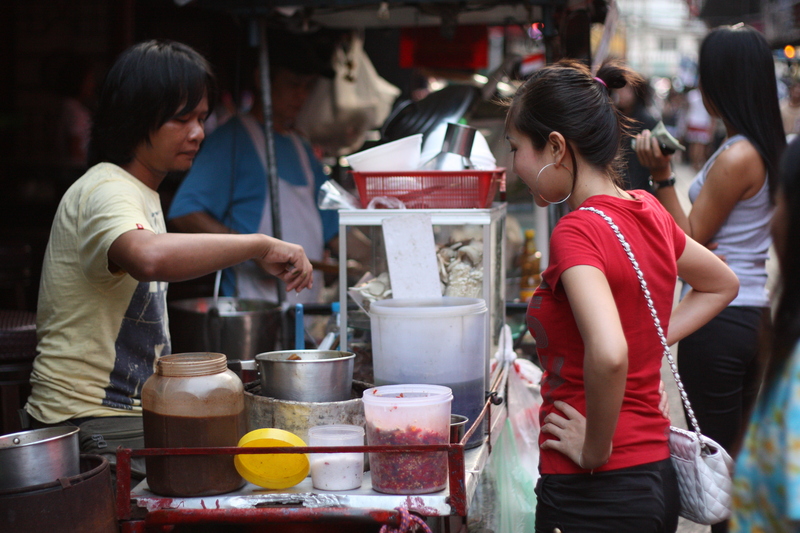 In the late afternoons, food sellers set up shop along the soi to feed the resident community—noodle stalls, stalls selling BBQ skewers, papaya salad carts, the usual street fare. 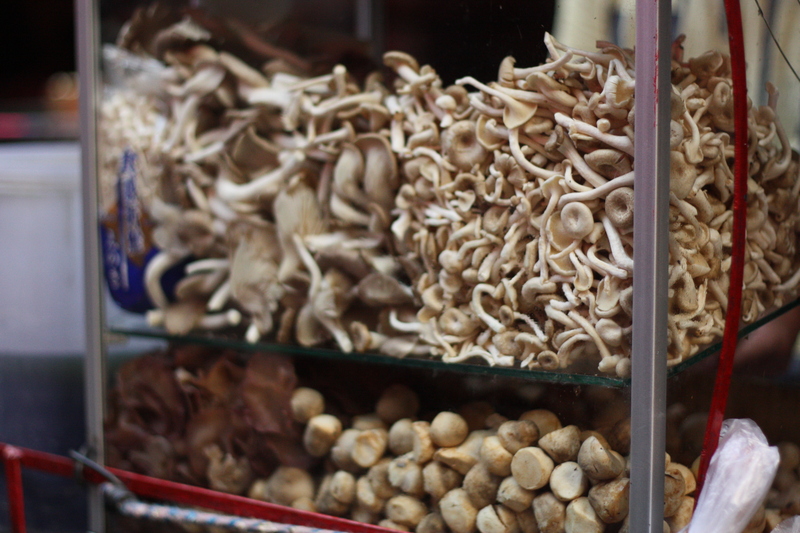 Returning to the hotel one evening, a cart caught my eye, its glass case filled to the brim with all manner of mushrooms. I asked the stall owner if it was “larb hed,” a mushroom “larb,” the Northern Thai salad from the Isaan region. He shook his head and pointed towards his dented, well-seasoned aluminum saucepan, saying something I couldn’t decipher. I had no idea what it was, but since I’d eat pretty much anything that has mushrooms in it, I ordered a serving of whatever it was he was selling. 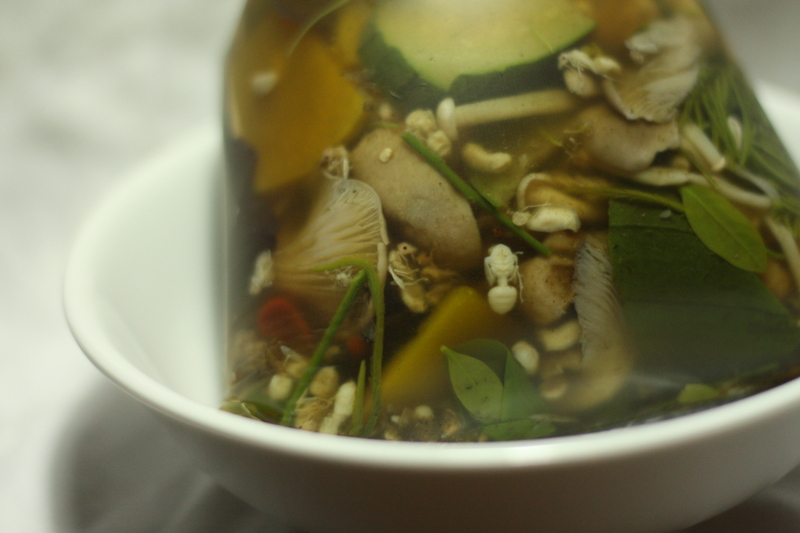 It turned out to be a mushroom soup, made with handfuls of fresh herbs, a medley of mushrooms, and a thick green soup base which he ladled out of a large plastic jar (visible in first photo above). The soup was utterly delicious; earthy and pungent, bright, with a spicy muay thai kick to the throat. And for only 20 baht. 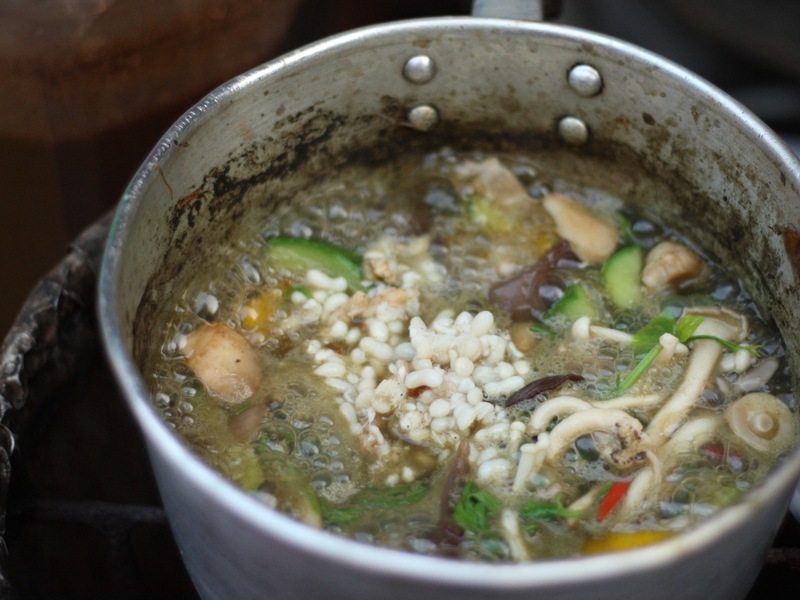 None of my Thai friends has been able to tell me what the soup is made from, only that “it’s some Isaan soup” or “tom hed” (mushroom soup). We had the soup every day from then on, often having it for late-night supper in our hotel room. Mushroom soup to-go-go. Since I was in the mood to splurge, I asked for the alien grubs. 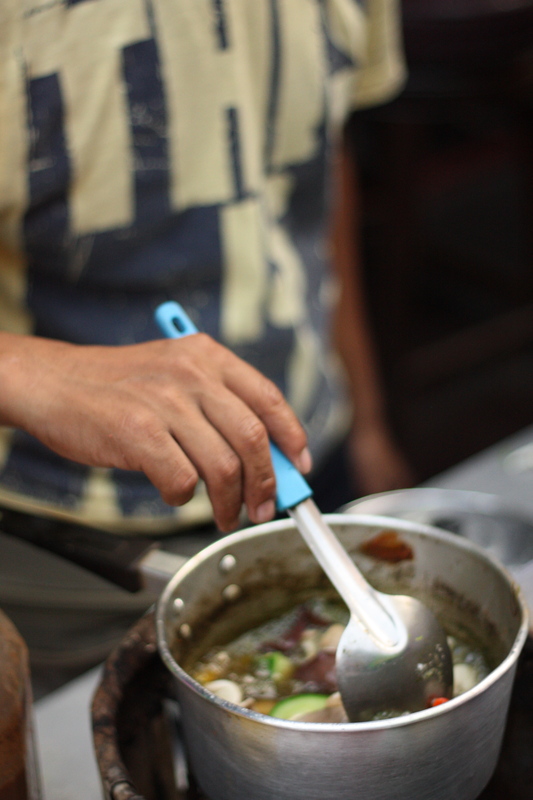 He obliged by plonking a heaping spoonful into the soup towards the end of the cooking process. The boiling soup then goes straight into a plastic bag—free BPA with every order! Walking back to the hotel, I inspected the bag, raising to eye level like a 2-year-old inspecting a bagged funfair goldfish. And it became clear what the larvae were—wasps. There they were, little soup fairies—wings, cinched abdomen and all—floating in suspended animation throughout the grassy green liquid. The wasp larvae didn’t contribute anything extra to the flavour of the soup; but they had a nice, soft crunch, not unlike the bite feel you get when chewing on the heads of enoki mushrooms. And I’m sure that they’re also rich in protein. And ladies and gentlemen, there you have it. The tastiest treat on Soi Cowboy. Address: Soi Cowboy, towards the Sukhumvit 23 end, on the left-hand side if you’re entering from there. This entry was posted on Tuesday, 22 June 2010 at 11:38 pm and is filed under Food. You can follow any responses to this entry through the RSS 2.0 feed. You can leave a response, or trackback from your own site. ok…will try the mushroom soup the next ti,e i go bangkok…minus the larvae. Peekture number one is a winner. The one with the mushrooms ain’t bad either! 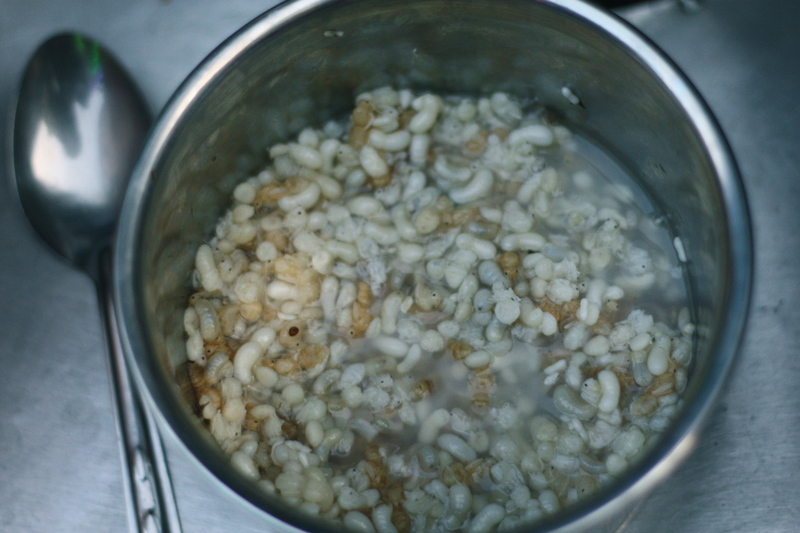 The mushroom soup sounds fantastic, not sure about the wasp larvae though…..
the soup look so comforting and savoury! I’d love to be able to be a part of class where I could find tips by additional seasoned people that discuss exactly the same interest. If you have virtually any tips, you should allow me to realize. Thank you!